These were a Christmas present to myself and a joy from start to finish, even after a false start. Huge grellow love! Everything about these Twylla socks will always remind me of a contented Christmas at the end of 2016. I bought the yarn at the Pom Pom Christmas party the week before Christmas (NB: there was never any doubt that I’d be using the same colours as shown in the pattern – they’re simultaneously beautifully retro and perfectly modern). Christmas Eve around midnight saw me at my parents’ house persuading Gareth to help me ball up the yarn, and Christmas morning I cast on surrounded by several of the people I love the most and a goodly amount of food and drink (god I love Christmas – when else is it acceptable to eat chocolate at 9am or 11.30pm, with a little tipple of something to go with it because come on, it’s Christmas?). 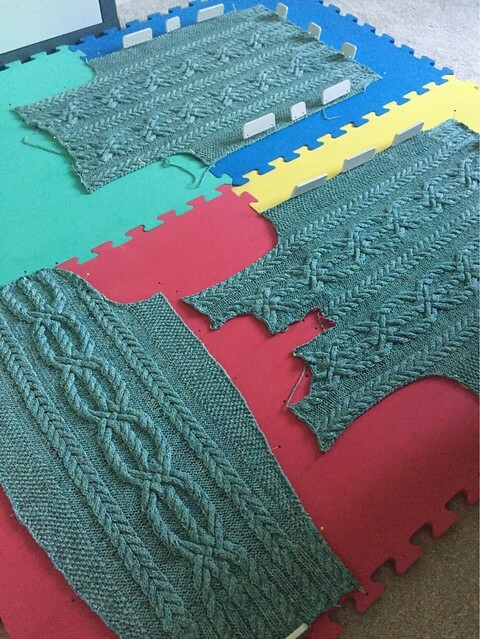 There’s never the chance to get bored with this pattern – on each segment you’re eagerly looking forward to the next bit. Which is just as well, because I lost a day of knitting to the too-tight colourwork gremlin (it’s been a while since I last did stranded knitting and I’d forgotten the perils that it holds). After I”d accepted that I couldn’t get it over my ankle (which took an hour or two of a censored internal monologue, as I was at my in-laws’ by then) I started again – this time on smaller needles but doing the medium size. And it worked out perfectly. Love the colours, love the different textures and patterns, love the fact that they mirror each other (knitterly details! ), love the slouchy tops brought about by the different ribbing broken up with stocking stitch. 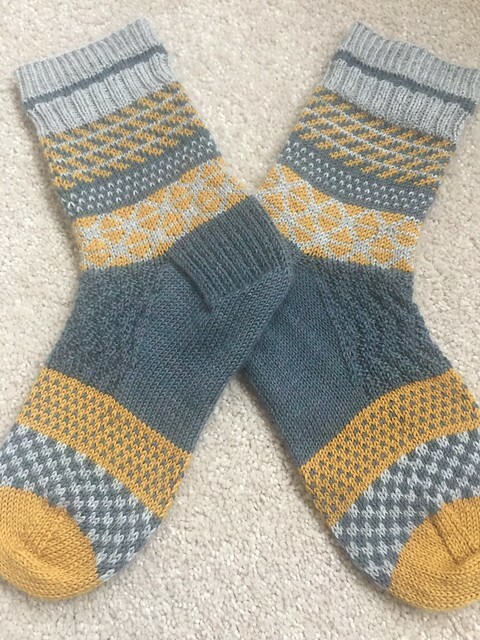 Really can’t recommend these enough – they flew off the needles and were my first finished project at the beginning of 2017. They were also the reason I really wanted to get my hands on a copy of Socks Yeah! 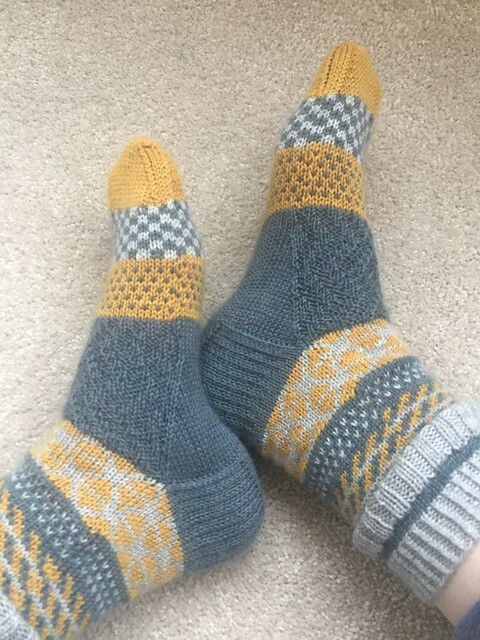 Vol 1, and anyone who’s looked at this blog in the last month or two will see that I’ve already had my money’s worth (three pairs of socks in two months! going to let myself be a little bit smug about that). Once the pieces are dry I need to make it up and then pick up and knit the hood and the neckband, so we’re not there yet, but this is definitely progress. All those winding cables neatly lined up and smiling at me – wow I love this project so much. And in the meantime I’ve cast on for a simple little shawlette using some vividly variegated Easyknits yarn that was a Christmas present from a clever friend who knows me well. I’ve been carrying the skein around the house with me for the last few days like a comfort blanket, working out what to use it for. I considered socks, but didn’t want the colours to pool. And I wanted something reasonably simple which could feasibly work as commuter knitting. 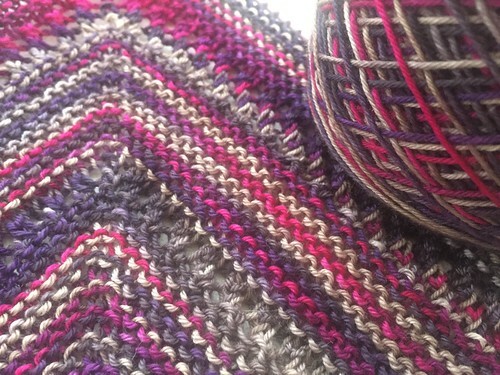 In the end I cast on for Reyna yesterday – it’s a super-easy garter/lace mesh shawl which creates a lovely jewelled effect with the colours in the yarn. 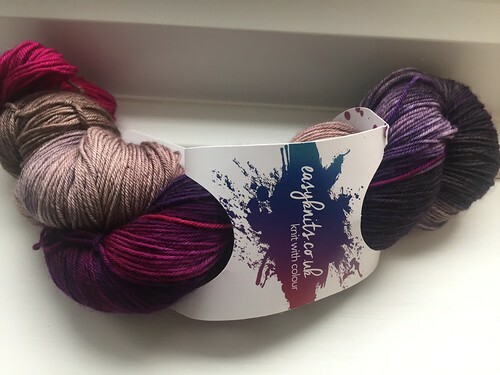 The colourway’s called ‘Frozen love’ and those deep purples and hot pinks contrasted with the greys bring to mind some kind of blackberry and raspberry cocktail (with vodka? yeah, vodka) served over crushed ice. Just delicious. Thank you for reading! 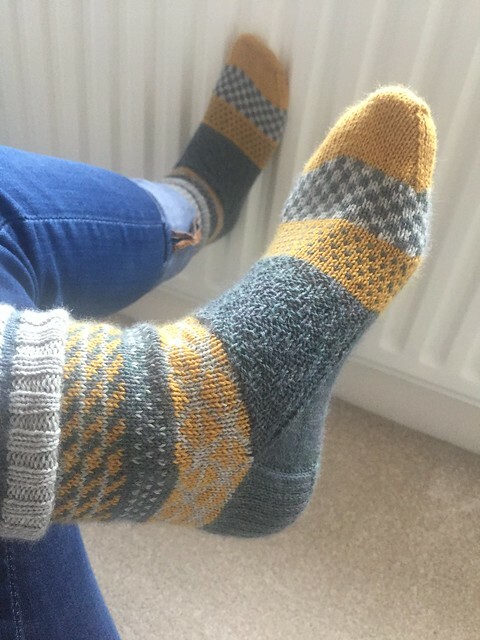 If you enjoyed this post then please use the buttons below to share, like, or leave me a comment – I love a knitterly chat. Ahh thank you. They were so much fun to make, can’t recommend them enough. I LOVE your socks! So comfy and eye catching, the yarn looks fabulous with all the color-work and textures. Thank you! They kept my smiling all the way through knitting them, even when I had to say goodbye to Christmas. Aww yay! I think they should leapfrog a couple of other patterns if they can, they’re so much fun to make. 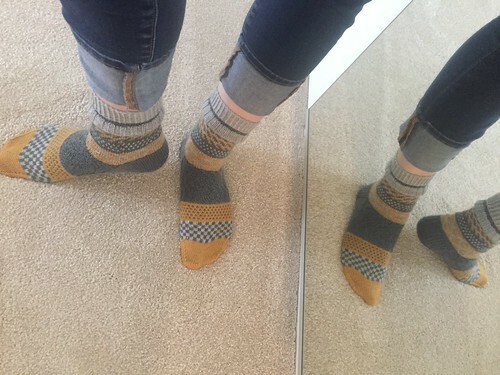 Amazing socks and mindblowing texture on your sweater!!! Wow! Looking forward to seeing it modeled! Haha, me too! Thank you 🙂 I’m hoping to achieve the seaming this weekend and to start picking up and knitting the hood after that, so hopefully there will be a finished hoodie before too long. Such incredible socks, love them!! And your WIPS are ticking along beautifully. Thank you very much 🙂 I seamed the jumper this weekend – very exciting! Just the hood to go now.